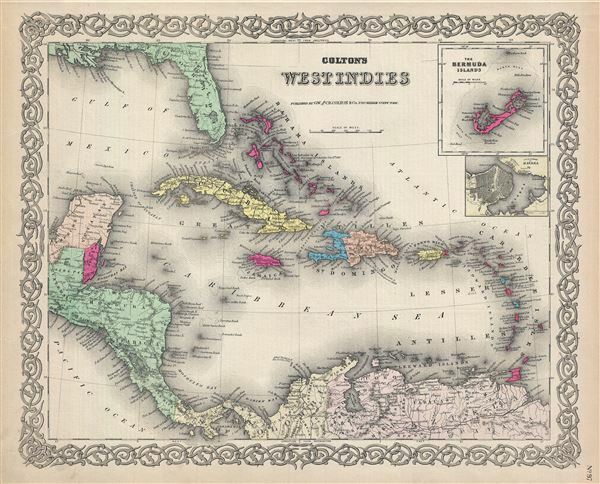 An excellent 1884 example of Colton's map of the West Indies. Like most of Colton's North America maps, this map was derived from an earlier wall map of North America produced by Colton and D. Griffing Johnson. Centered on Santo Domingo (Hispaniola), this map extends north to include the to cover all of Florida, south as far as Panama Bay and the Spanish Main, and east as far as Barbados and the Windward Islands (Antilles). Two insets in the top right quadrant detail the Bermuda Islands and the City and Harbor of Havana. The map identifies the island of San Salvador or Cat Island in the Bahamas as the site where Columbus supposedly landed on October 12 of 1492. Colton also identifies the site off the southern shore of Santo Domingo where Sir John Duckworth defeated the remainder of the French fleet following the Battle of Trafalgar. Additionally various cities, towns, forts, rivers, rapids, fords, and an assortment of other topographical details are noted. Map is hand colored in pink, green, yellow and blue pastels to define national and regional boundaries. Surrounded by Colton's typical spiral motif border. Published from Colton's 172 William Street Office in New York City. Issued as page no. 97 in Colton's 1884 Atlas of the World. Colton, G. W., Colton's Atlas of the World, illustrating Physical and Political Geography, (J. H. Colton and Company: New York) 1884.